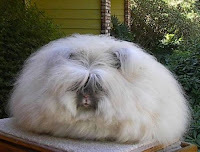 Description: This breed of rabbit is recognized by its unusually long hair. In many countries this kind of rabbit is a significant and steady source of income and it is important to notice that, unlike other animals for their fur, rabbits should not be sacrificed, but only trimmed. Every 3 months you can cut the rabbit’s hair and use it in the manufacturing of angora wool. Beds or articles of clothing made out ​​of this material are considered extremely fluffy and extremely popular. There are several types of Angora rabbits, but the most remarkable is the Satin Angora rabbit, which has a shiny hair and a more intense color. The proposed business is farming Angora rabbits for their fur. It can harvest annually up to 2 pounds of hair, which is used for garments mixed with other types of wool. Textile products made ​​from such materials are used for medical purposes in the treatment of rheumatism. - money for buying the first family of rabbits, the purchase price, approximately 50 dollars. Conclusion: For those who have the resources needed, it is a business with minimal investment which is definitely worth trying, especially as there is little competition. 0 Response to "Angora rabbit"